Thank you all for the sweet, sweet words. I'm overwhelmed with the love from this little space and feel so blessed to get to share this special time with y'all! I thought it might be fun to share a little from the first trimester today! I very intentionally took the first two trimesters to just soak up the time and special moments with Tanner and family. Our lives have been so incredibly busy since we found out in the Fall with holidays, starting a new business and social commitments that blogging took a back seat. I wanted to spend all my spare moments thinking about baby boy and spending time with Tanner. There is something about knowing that your time as just two is coming to a close that makes each spare second so much more important. It was also so nice to capture the my thoughts and take photos without the pressure of having them blog ready. Just simple documentation for our little family to enjoy as the seasons change. There are several questionnaires floating around the blog world so I thought I would pull out a few of my favorites to highlight the first 14 weeks! Hope you enjoy! How I found out: I found out the Friday morning after our large annual customer event which I spend around 9 months planning. The week was great but it's always so crazy and exhausting with events starting Monday and ending on Wednesday evening. My co-planner and I always run on adrenaline during this week and take Friday off to recover. This year was a little unique because on Thursday we hosted a kick-off event for our new business, so I jumped right from my work event to his. We had a great time with family and friends but about half way through, I started feeling very lightheaded and dizzy. When I felt like I was close to fainting I asked my mom to get Tanner. I had him take me home and was sure I was just exhausted from the week. I slept in on Friday and woke up for a quite morning of coffee on the couch, about half way through the view I realized that I never started earlier in the week and decided to run out and get a few tests. Three positive tests later, I was very much in shock and spent the rest of the day soaking in the news and thinking about how I was going to tell Tanner and what amazing gift we had just been given. How I told Tanner: The evening I found out ATX got our first real cold front of the season. In celebration we had planned a quite night at home with a fire and move after a quick dinner out. We had been running in opposite directions all week and just needed a night to chill and enjoy the newly cold air. 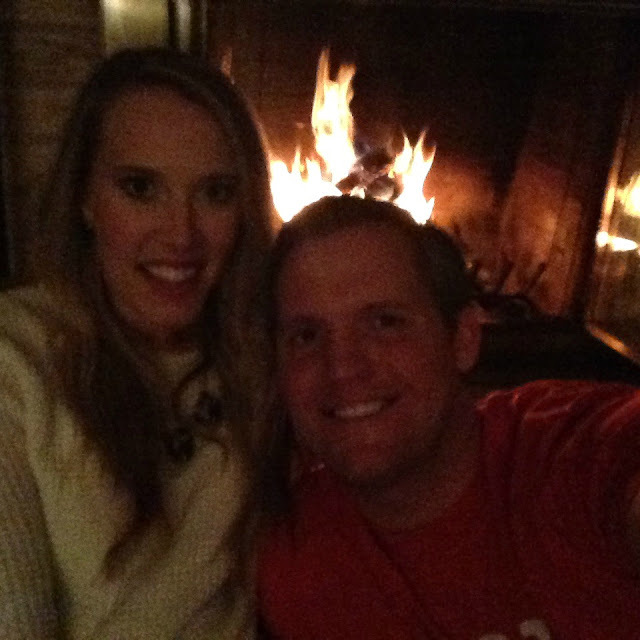 We went through dinner chatting and laughing like normal and came home to make a fire and put on the movie. While he was making the fire, my heart was pounding! I was so excited to tell him, but also a little anxious! This was the first time I was sharing news that was going to change his life forever! Before we started the movie I handed him a little note and box that shared the news…he was so excited. I’ll never forget the look on his face and the sweet words he shared with me. I knew even more in that moment that God had blessed me with the best partner for this life! This picture quality is horrible but it's the only one I snapped right before I told him! Total weight gained: I gained 5 lbs in the first 14 weeks. Sleep - Around week seven I started having a very hard time staying asleep which was so very frustrating but a sign of things to come. I was so very tired and would dream about naps while I was at work. I never had a hard time falling asleep during the first trimester but I couldn’t stay asleep. I would wake up and just toss and turn for hours. I got into a routine of two-three nights of bad sleep and one night of good. I've never had insomnia and have always been a good sleeper, so this was pretty hard for me. All-day Sickness – Starting at week six I was very sick from morning to night. I have never had that level of nausea and had no idea I could throw up that much! I remember that feeling of panic when I realized that I had no idea how long this was going to last. Most tell you that you just need to make it to week 12, but others talk about throwing up right until delivery. I was so scared I was going to be the latter. I remember telling Tanner that we were only going to have one child because there was no way I could do this again. Around week nine I broke down and got meds from the doctor that saved me; they didn’t take it all away but I was able to function at work and started to feel like a human again! So thankful for those! Food cravings: I stuck mainly to carbs and water or sprite until around week 16. Crackers, toast, scrambled eggs, soup and oatmeal were staples. The thought of most protein and veggies made me want to throw-up! Miss anything: I missed not being sick and feeling like I was participating in life with everyone. I really take for-granted being able to do all of life's activities with a healthy body. Being sick that much made me extremely grateful for good health! Movement: I didn’t feel any moment during the first 14 weeks. Have you started to show yet: Not really! Maternity clothes: I didn’t wear maternity clothes until around week 17 but I did transition to very flowy tops and I went up two bra sizes! 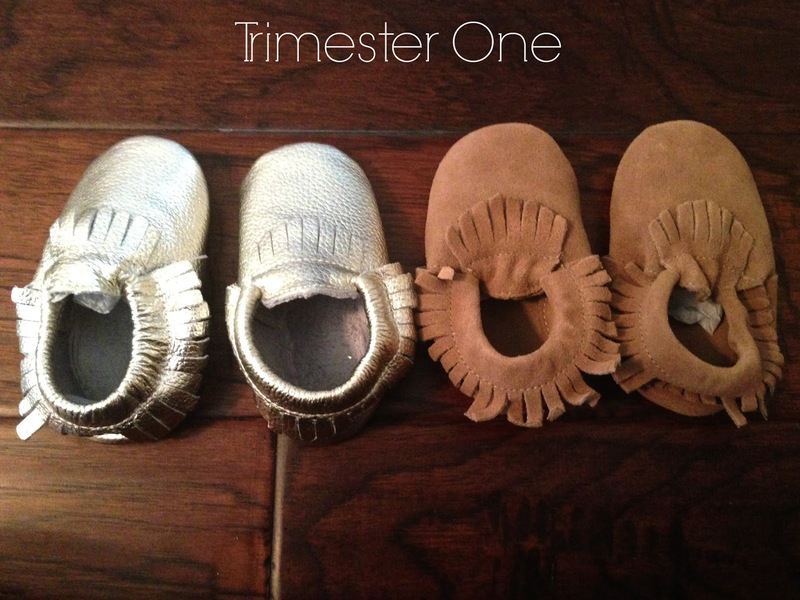 That was the biggest change I noticed in trimester one; they seemed to just grow and grow! Stretch marks: Thankfully no stretch marks in trimester one. Gender: We didn’t do any genetic testing at week 11 so we didn’t know what we were having until week 20! Best moments of Trimester One: My favorite moments during the first 14 weeks were seeing and hearing the baby, telling our families the news at Christmas and enjoying the celebration with my two cousins who were pregnant at the same time! Here is a short clip from when we told my family! What we are looking forward to: Telling our friends and coworkers, finding out the gender, seeing a bump start, and planning the baby moon!